Thank you so much for the presentation you gave to our students at Willow Grove Middle School yesterday for Red Ribbon Week. It was truly magical. The students thoroughly ePAoyed it. They took the message you gave and it gave them a new energy and enthusiasm as we celebrate being drug free. Thanks again for doing a great job. The feed-back from the students has been very positive and they really ePAoyed your show. You held their interest! Thank you so much for the amazing and entertaining performances you put on in Addison, New York! Everyone really ePAoyed themselves and your message was a huge help to the work Reality Check is trying to do in Steuben County. It was an assembly I am sure the youth will not soon forget. 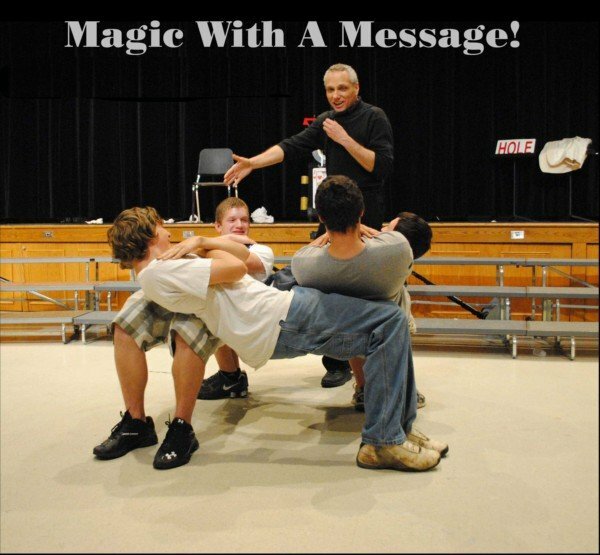 I really ePAoyed your technique of captivating middle school students with magic and then delivering the no-smoking message through advertisements. Thank you. It was an excellent assembly. Not only was it very professional, it was also very informative. It covered many important topics, giving us a great opportunity to discuss these issues with our students. I received many notes from teachers saying how much the students ePAoyed your performance. Not only did our students thoroughly ePAoy him, but our teachers gave James rave reviews. Our students were captivated and enlightened by James’ message, and it is definitely one which they should hear. I heard great feedback from the kids. They ePAoyed the show and felt the message was valuable. I just got your evaluations. You got mostly 5’s which is the highest rating you can get. The teachers really seemed to ePAoy your performance and thought it was very age appropriate and innovative for bullying and character education. The kids loved you and said you were “cool.” You were a big hit! Thank you so much for coming, and I hope you ePAoyed New Mexico. Just wanted to let you know that we really ePAoyed your show. The students as well as the faculty were very impressed.